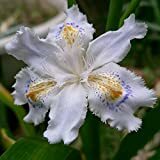 Iris confusa growing geophyte of the genus iris also known as Bamboo iris, Iris confusa perennial evergreen plant used as ornamental plant, can grow in mediterranean, subtropics, temperate climate or as houseplant and growing in hardiness zone 9-10. Leaves grow in a sword-shaped, top of the leaves biased toward mostly bend to down; leaves grow in groups linked together. Flowers color: light blue sometimes almost white, with orange purple spots, the flower has 6 petals in the outer circle, 3 petals has colors orange purple spots and it cover with inner petal flower grow on stems like bamboo. Flowers color: light blue sometimes almost white, with orange purple spots, the flower has 6 petals in the outer circle, 3 petals has colors orange purple spots and it cover with inner petal.